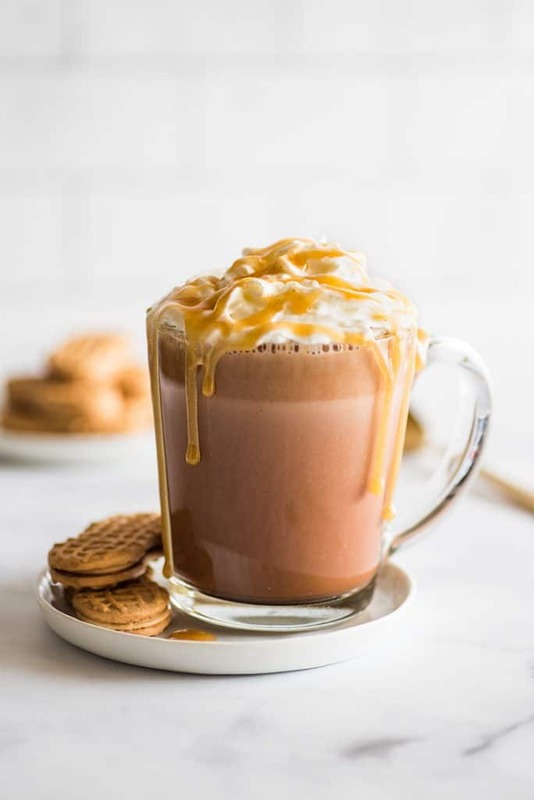 I have a ton of hot chocolate recipes on the site, Classic Hot Chocolate, Rich and Thick Hot Chocolate, White Hot Chocolate, Pink Hot Chocolate. I thought I had pretty much all my hot chocolate bases covered. But last year someone left me a comment blew my mind. They told me that they had taken my classic hot chocolate and made it into Peanut Butter Hot Chocolate. As a lover of all things peanut butter, obviously I had to give this a try, and friends, I’m so glad I did, because it’s real good. 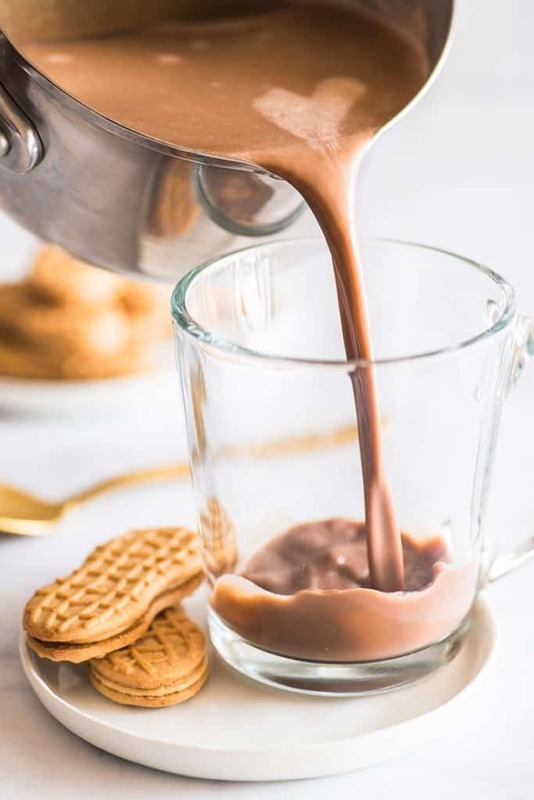 Adding peanut butter to hot chocolate not only makes your hot chocolate a peanut buttery delight, it also gives it a rich and creamy texture, so it feels 10xs more decadent. Making Peanut Butter Hot Chocolate at home is really simple. 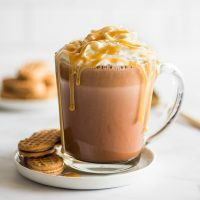 It’s just classic hot chocolate made with cocoa powder, sugar, a little water, and milk heated together with a spoonful of peanut butter whisked in. If you are feeling a little extra, you can add whipped cream and Peanut Butter Sauce like I did, but that’s totally optional. This recipe calls for smooth peanut butter, something like this. I haven’t tested it with natural peanut butter, but I wouldn’t recommend it. I have a feeling even smooth natural peanut butter will have too much texture to stir into a drink unless you use a blender to mix it. This recipe makes 1 cup of hot chocolate, enough to fill an 8-ounce mug. If you’d like to fill an oversized mug, 1 1/2 or double the recipe. Looking for more peanut butter and chocolate desserts? Try these Buckeye Brownie Cookies, Small-batch Peanut Butter Oatmeal Cookies, Peanut Butter Swirl Brownies, and Easy Homemade Peanut Butter Cups. In a small saucepan, combine sugar, cocoa powder, and water. Heat over medium heat and stir until sugar and cocoa powder dissolve. Add milk and peanut butter and stir. Heat, stirring occasionally, until milk begins to steam and peanut butter is completely dissolved. 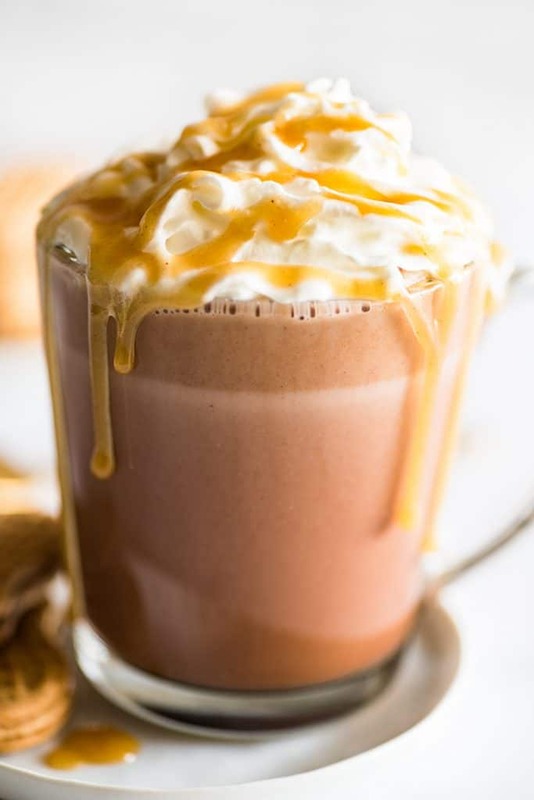 Pour into an 8-ounce mug, top with optional whipped cream and peanut butter sauce if desired and enjoy. Approximate nutritional information is for Peanut Butter Hot Chocolate only. To make peanut butter sauce, combine 2 tablespoons corn syrup and 1 tablespoon peanut butter in a small microwave-safe bowl. Microwave for 10 to 20 seconds, until syrup just begins to bubble. Carefully remove from microwave and stir until completely mixed and smooth.